- a full report can be viewed in any of four different languages: English, Portuguese, Spanish or Italian. For an example of the TQ7 report, please view this link. The final two pages of the report are the whole-brain training plan and executive summary narrative. The TLC Suite also includes a subjective report of the client's history and symptoms, which integrates into the TQ7 report and alters the training recommendations for the whole-brain training plan. This means the software takes the specific client's circumstances into account and alters its recommendation based on what would be personally best for them. 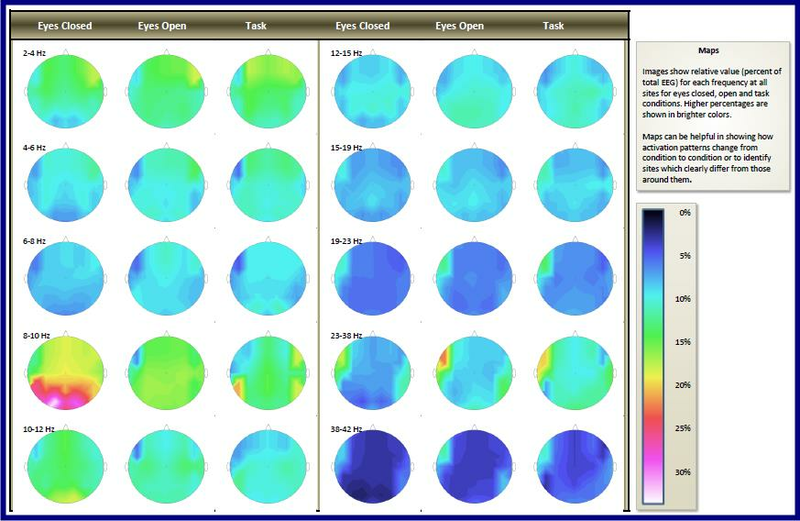 A major advantage of the TLC suite and method is that it is an EEG pattern-based assessment tool rather than population-based tool. In other words, it is descriptive rather than normative: it focuses the trainer's attention on patterns in the EEG that have been identified in QEEG research to be correlated with various symptom constellations and clinical syndromes, guiding the trainer toward interventions likely to have rapid positive effects. It does not base its analysis and recommendations on imperfect population databases. This suite allows for the output of data comparable to a full qEEG evaluation, without the cost of purchasing excessive hardware and software to support such a method. Only 2 or 4 EEG-Z sensors/channels of EEG and 1 hour of time are required to run a full assessment. Unlike other methods, the cost for this automated EEG analysis tool is a one-time fee with no limits on the numbers of evaluations that can be run through the system. No yearly fees or additional upgrade prices. The TLC suites require the use of the latest version of BioGraph Infiniti software and Thought Technology Infiniti hardware. THIS SOFTWARE IS DELIVERED BY DIRECT DOWNLOAD when purchase is complete. Download may take up to 30 minutes depending on your internet connection. Note: BFE discount codes, dealer or affiliate discount codes cannot be applied to the purchase of this dual-party collaborative product.